A review of all the required information on your dietary or herbal supplement label. 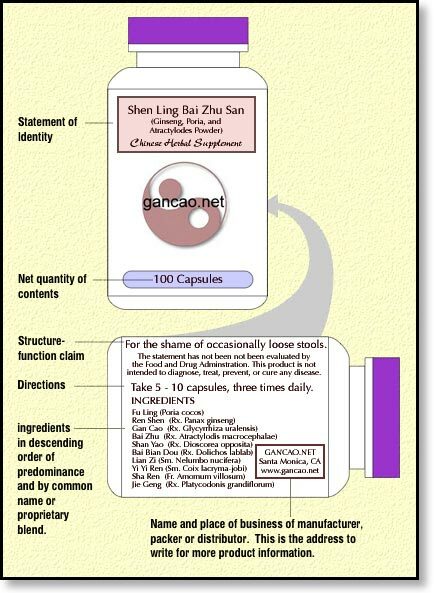 the net quantity of contents statement (amount of the dietary supplement),This can be in a quantity such as “100 Capsules” or a net weight such as “100 gm. (3.5 oz.)”. Don’t forget to include both the metric and US standard weights. You can also put both on the label if you’re just that kind of guy. the nutritional information This is where we talk about recommended allowances on that special box that we find on most often on food products. This is only required if your company is making more than $500,000 per year. So, we’re going to leave this part off our label until we hit the big time. the ingredient list Remember to begin with the word “Ingredients” and include the “common name” (which I have decided means Pinyin) and the Latin binomial (two words) plus the part of the plant or animal when applicable. the name and place of business of the manufacturer, packer, or distributor.This one has some wiggle room. You can include the entire street address or, if a consumer can easily find you, you can get away with just the city, state, and zip code. The toll-free phone number is optional. I feel that adding your website address makes a lot of sense here too, provided your address is your own domain name and not a long address based on yahoo or AOL or some other free-with-your-account type website addresses. Country of origin If the product or its ingredients are not from the USA, the tariff Act requires that every article of foreign origin imported into the US conspicuously indicate the English name of the country of origin.I have not seen this added to most of the products manufactured here even when their ingredients are from Taiwan or mainland China and so I’m thinking that there may be an exception floating around out there somewhere that is not addressed in the guidelines on which these articles are based. Expiration dating As for expiration dating, this is optional. However if it is included, it should be supported by valid data demonstrating that it is not false or misleading. The “structure-function claim” (along with the DSHEA disclaimer) to our image below just to complete the illustration. These items will be discussed in the next portion of this DSHEA tutorial. Next, claims. A whole other issue entirely.